The Cotswolds is a region of undulations stretching across almost 800-square miles (25 miles across and 90 miles long), which roll away eastwards from a limestone escarpment of Jurassic rock. 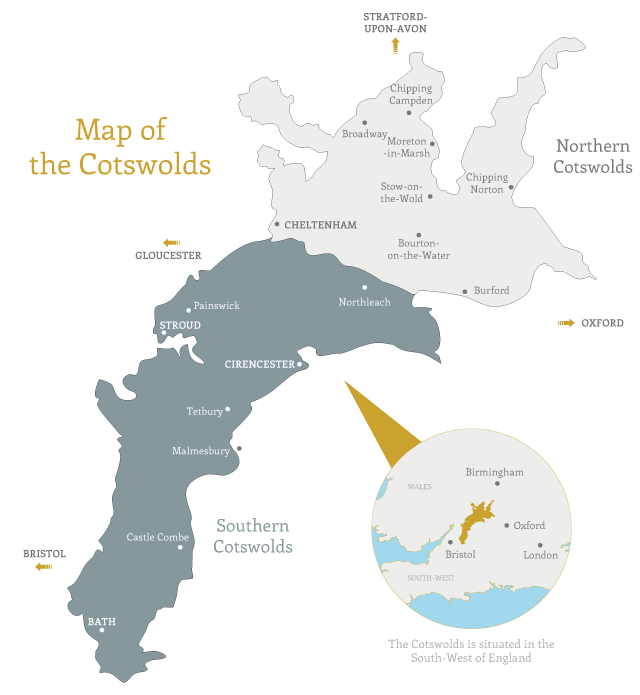 The Cotswolds spans across five counties (Gloucestershire, Worcestershire, Warwickshire, Oxfordshire and Wiltshire) and is the largest Area of Outstanding Natural Beauty across England and Wales. 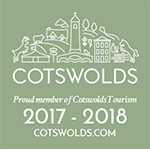 The Cotswolds is a landscape of immense variety and can be divided into the northern and southern regions, where you’ll find the landscape, stone, flora and fauna changes as you travel through the region. Many honey-coloured market towns, hamlets and villages make up the Cotswolds between the woollen market town of Chipping Campden and the historic city of Bath – which are also the start and end-points for the 102-mile long Cotswold Way National Trail. Places across the Cotswolds are connected by winding country lanes and hidden wooded valleys, which at the next turn can quickly change to widespread views of rolling wildflower fields, agricultural grasslands and open skies. Convenient transport throughout the Cotswolds is a must if you want to make the most of your visit to the region. Whilst other options are available with careful planning, such as train and bus journey’s, the most effective mode of transport once you’re in the Cotswolds is by car. 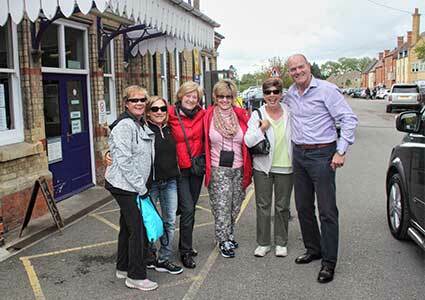 We recommend that if travelling from London, you take a train direct to the Cotswolds from London Paddington to either Moreton-in-Marsh or Honeybourne train station, where your guide will be waiting for your arrival to commence your tour. A full-day tour in our private vehicles (typically 8-hours and seating up to 7 passengers) will ensure that you don’t need to worry about navigating the country lanes, seeing those often-missed locations, covering between 10-15 towns, villages and other points of interest during your day (actual number depends on chosen activities and time spent in each location). Spring in the Cotswolds is when new buds on trees form, shoots of plant life emerge from the ground, spring bulbs turn to flowers which come in waves of daffodils, snowdrops, tulips, hyacinths and bluebells. Wild garlic and primroses fill woodlands and wild daisies, cowslips and wild orchids appear in meadows. Wisteria blooms in late Spring. Lambs and calfs are born throughout early Spring and birds either return from migration or nesting birds see their eggs hatching. The sun and the ground begin to warm, however expect frequent showers amidst sunny spells. Several events kick off the year, starting with the Cheltenham Gold Cup in mid-Mach. Easter egg hunts across many Cotswold attractions also find their way into the events calendar and in April you’ll see the Cheltenham Jazz Festival followed in May by the classic Cheeserolling event at Cooper’s Hill, which sees bold and brave Cotswoldians launch themselves down one of the steepest hills after a fast-rolling cheese wheel of Double Gloucester. 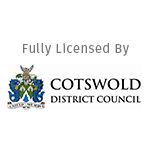 Amonsgt other events, there’s also the Chipping Campden Music Festival and Oxford Literary Festival. Summer is on the whole, very warm, although nights can still get chilly. Late nights play host to Al Fresco dining–where it doesn’t go dark until gone 10.30pm–and there’s a variety of food and music festivals and outdoor events such as open air cinema screenings at locations such as Sudeley Castle, Cheltenham Lido and Blenheim Palace. Throughout the gardens of the Cotswolds, English roses develop into full-bloom and bright garden flowers continually provide waves of colourful displays throughout the season. Local farms also open to the public for PYO (‘Pick Your Own’) days, where fresh fruit such as strawberries and raspberries and other local produce are in abundance. Driving along country lanes, you’ll see bright red fields of poppies and plenty of wildflower meadows. Summer is the perfect season to embrace Cotswold walks, nature trails and outdoor picnics. Events occur most weekends throughout the Summer, as well as one-off and annual events, such as Bourton-on-the-Water’s quirky game of football in the river during the August bank holiday. The Cotswolds’ ever changing landscape delivers a sight to behold whatever time of year you visit. During the Autumn months, you can expect a stunning backdrop of russet reds and shimmering golds amidst the trees. Honey-coloured stone becomes illuminated golden as the sun sets in the evening. Attractions start to turn their events to nighttime activities such as Batsford Arboretum’s Bat Walks, Cotswold Falconry’s Owl Evenings (available for booking from Mid-Summer to end of October) and Hidcote Manor Garden’s ‘The Enchanted Garden’ where trees are artistically illuminated throughout the grounds against the darkness of the night. Autumn fruits are ripe for the picking and ready to be preserved in liquors and cooked in desserts; you’ll find hedgerow and woodland berries and fruits such as blackberries, damsons, mulberries, sloes, bullaces, apples, pears and sweet chestnuts in abundance during the Autumn. Crisp mornings present stunning frosted landscapes. Cotswold pubs and inns come into their own as the days draw closer; cosy 16th Century eateries and bolt-holes welcome you with roaring log fires and period charm, where you’ll have an opportunity to sample local food, ales, ciders and ladles of mulled wine. Christmas markets and pop-up ice skating rinks appear in cities and larger towns which can be visited during your tour. Less daylight in the Winter means that we offer shorter 4-6 hour tours to accommodate. Attractions such as Sudeley Castle also hold events to take advantage of the lower light levels, such as their Spectacle of Light where you follow a trail of dramatic and fantastical lighting throughout Sudeley’s magical gardens and romantic ruins. Although the Cotswolds is associated with its picture-perfect rows of cottages, natural beauty and tranquillity, the area also has much history, including the many magnificent medieval churches, Abbeys – such as the 12th Century Hailes Abbey, private manor houses, ancient monuments, Roman villas and monoliths, castles and stately palaces. Once home to a thriving woollen-market trade that brought prosperity to the region, the Cotswolds now plays host to a wide range of independent businesses and retailers. During your tour there will be many opportunities to visit well-known attractions across the region, such as some of the many gardens owned by the National Trust (such as Hidcote Manor Gardens, Snowshill Manor), the English Heritage and other privately owned properties. If history and gardens don’t quite float your boat, we can arrange for many other activities and experiences for you to enjoy during your day and enhance your tour experience. There’s many options to choose from so we recommend letting us know your interests and we’ll provide the suggestions. 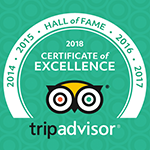 If you are considering a tour of the Cotswolds, then please contact us who will endeavour to build a tailored itinerary to suit your interests. Amongst the towns and villages, you’ll also find an abundance of Cotswold gardens to visit. Just outside Chipping Campden is the 17th Century Hidcote Manor House and Garden developed by the celebrated American horticulturist, Lawrence Johnston, who divided the garden into a series of ‘outdoor rooms’, each with its own character featuring exotic and unusual plants. A short walk down the road from Hidcote Bartrim is also the smaller Kiftsgate Court Gardens – famed for its rare plants and shrubs, the ‘Kiftsgate Rose’ – claimed to be the largest in England – and for being the creation of three generations of women gardeners. Other popular Cotswold gardens include Sezincote – a 4,500 acre estate with a 200-year-old Mogul Indian Palace amidst a romantic landscape of temples, waterfalls and grottoes and the theatrical Painswick Rococo Garden, designed in the 1700s and the country’s sole surviving rococo garden. The Cotswolds is also home to the country’s largest private collection of trees and shrubs at Batsford Arboretum in the north Cotswolds. There’s also Westonbirt Arboretum near the historic market town of Tetbury in the southern Cotswolds. Westonbirt boasts one of the finest tree collections in the world and is considered one of the world’s most important arboretums. Whilst not strictly a garden, there’s also Cotswold Lavender just outside the village of Snowshill in the north Cotswolds. During July and August you can visit the family farm and walk through its lavender fields in full bloom, as well as catch a sight of the harvest and distillation process when it takes place around the end of July. A not-to-miss experience where you’ll see around 70-miles of rows of lavender, boasting 35 different varieties the farm boasts and grand total of 250,000 plants. The farm also has its own café and shop selling a range of lavender gifts and toiletries made from the farm’s own lavender harvest. The region today boasts diversity and talent and has also see a revival of rural craft skills with a focus on sustainability over the past 15 years. Learnt by those wanting to reawaken important ancient skills, regenerating and maintaining the distinctive and unique landscape we see today, these skills include; roof thatching, dry-stone walling (where over 4,000 miles of dry-stone walls run across the Cotswold landscape), blacksmithing, wood and stone-carving, hedge laying and weaving amongst many others.